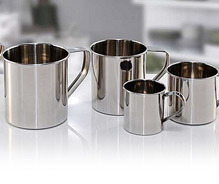 Stainless steel mugs and containers of various designs and in different shapes makes serving much easier. 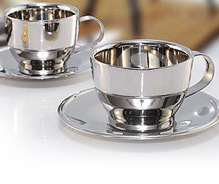 This double wall teacup, elegantly designed in the oval shape, is perfect for serving tea with style. Perfectly suited for a multitude of hot and cold beverages. 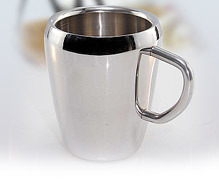 This double wall coffee mug is made of finest quality stainless steel. Available in both large and small sizes, these vessels guarantee that their contents will remain hot for a longer period of time while the glass itself remains cool to the touch. 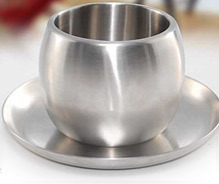 We offer the best quality coffee cup that has double wall for keeping your coffee hot for longer period of time. 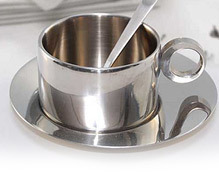 Available with a saucer, the cup has a ring shape standard size handle, which is perfect for sipping coffee. Combining form, function and style, this mug has perfect fitting lid which makes it safer to store anything in the kitchen. 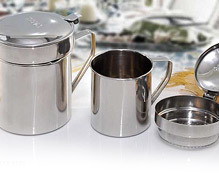 Designed with a contemporary flair, this stainless steel oil pot is an essential addition to the kitchen and can also be used on the table. A flip top lid makes it easy to pour in oil and also makes it easy to clean. This set of deep mug is available in different sizes. 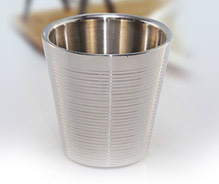 It is specially designed to keep hot drinks warmer and cool drinks cooler. This simple yet functional double wall cappuccino mug is ideal to serve your favourite hot coffee on a cold winter evening. It features a tubular hollow handle. 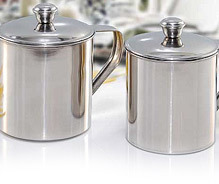 For a multitude of hot and cold beverages, this double wall espresso mug has twin advantages while it keeps the content hot or cold for longer time, its outer surface remains unaffected.